Want to reach our highly targeted audience of experts and authors? Or our thousands of interviewer hosts? We can help you with customized email blasts! Each email goes out to our worldwide audience to help you promote your products or services. Email blasts currently cost $199 each and can usually be scheduled within 5 business days. Discounts apply to orders of 3 or more. If you are interested, email us at pr @ interviewguestsdirectory.com. 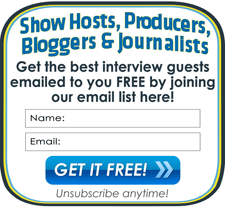 Whether you are trying to reach experts and authors who list with us OR the people who interview them (radio hosts, bloggers, journalists, etc. ), or both. Use the subject line "IGD Special Edition Request". Contact us to share these details on your project, product, or service and we'll get right back to you!